As I have mentioned many a time before, I'm a list person. I love nothing more than checking items off a to-do list, they are essential to keep me on track and they feed my OCD hyper-organizational side with ease. Although my most looked at and used list is a little one I keep in my Phone. My Closet List. Now that spring is here, well it was 80 last week and it's currently 40, so.... it will be here soon! You can sure bet it's been updated. Plus who doesn't love peeking into what others have been buying (so you could have that chance to snag as well, if you want before they are gone) and what they have their eye one. Here is a peak at my current list, what tops my 'Want' & what has recently been purchased, the 'Bought' - checked off the list! Bought: New Parka style light jacket - I had been searching for something neutral, casual & cute. I scooped up this parka, in a lighter kahki & couldn't be happier. Rustic yet refined and can easily be worn in so many ways! Also purchased a new bright colored top! I love a patterned top but solids get the most wear, and I love the lace detail on this top - and the back is even better, all lace! Can't wait to wear it! Oh and I NEED RX sunnies & a brown cross body bag.... amongst others. But the above will becoming home first me thinks! I'll be sure to let you know! 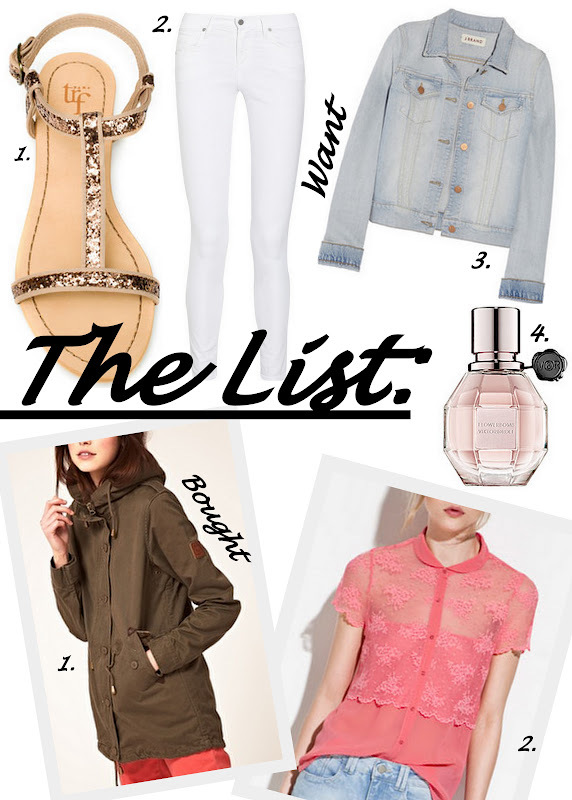 What items are your list for spring that you still have to get? What have you already purchased??? PS - Happy Friday & weekend!!! You need Flowerbomb! I love it so much I bought the rollerball this week so I can always have it with me. I LOVE the jacket you bought! I've been eyeing those Zara sandals too I think they'd be perfect for summer! White skinnies were a priority on my list. I know they're going to pair perfectly with flowy spring blouses! I've already been rocking my light-colored jean jacket too (an Old Navy pick-up from years ago!). Great list! Oh I love the white skinnies paired with the gold sandals. Gorgeous! That parka is so perfect and I adore the glittery sandals. Great list. darling! I love those sandals. So cute! Love your picks! I've actually done quite a bit of shopping already because I was in NOLA a few weeks ago and I had to dress for the warm weather. I do need some more flat sandals though. Can never have too many of those because I live in them in the warmer months. You know I bought those sandals and encourage you to do the same! Love the light jacket. Love those sandals, I'm in search for my perfect summer shoes right now.